Diane Farris has a long history of supporting emerging artists, some while they are still in school and others as recent graduates. When I first met Farris in 1990, she was showing intriguing portraits by Chris Woods of his friends engaged in what appeared to be mysterious rites. Many viewers thought the 21-year-old Woods had talent, but it was Farris who immediately gave him a gallery show. A few years earlier, Farris had been similarly instrumental in showcasing Richard Attila Lukacs's paintings and introducing his work to the international art market. Unlike many art dealers who make landscapes and abstracts their mainstay, Farris often presents art that is puzzling, even risky. She frequently shows figurative work and portraiture that her peers might deem to be unsaleable. As she told me recently, she chooses with her heart, not her head. The current exhibition of paintings and drawings by Jesse Garbe confirms that Farris has not lost her touch in selecting promising new artists. Garbe is just 26 years of age and this is his first solo show. He won the 2003 Alvin Balkind Scholarship while he was an undergraduate at Emily Carr Institute of Art and Design, suggesting that his skills have already received a measure of recognition. Garbe's exhibition at the Diane Farris Gallery gives credence to the directive, "write (or paint) what you know." The gallery space is filled with all manner of portraits; full-length, heads, and torsos. Approximately one-fifth are self-portraits. All the others, except for the painting of art dealer Farris, are of family and friends. Virtually all make careful reference to the studio space in which they were engendered, right down to the different colours of the walls, the bits of green tape on the floor that keep the position of the subjects constant during the sittings, and the exact shapes of each white splatter on the studio's red floor where Garbe paints hour after hour, day after day. In addition, the full-length paintings include a portrait of the artist painting the portrait. All are broadly but accurately rendered in a manner that references Garbe's thorough understanding of Vel�zquez, Goya, and Manet. All these elements are present in The Studio, a full-length depiction of a former classmate of the artist. The sombre young man who stands at the centre of the canvas looking directly at the viewer is reminiscent of Manet's The Fifer. The dense shadow surrounding him adds a note of drama, while the tape on the floor gives insight into the almost scientific approach Garbe takes to insure this portrait conveys an aura of immutability. 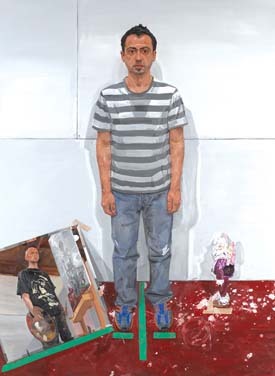 The image at bottom left, showing the artist painting his friend, appears at first to be an actual canvas propped up in its own specially designated spot. A closer inspection reveals, however, that what the viewer sees is a reflection in a mirror. By introducing the device of a mirror into almost all of his portraits, Garbe intentionally creates a series of pictorial puzzles. The Studio is a conundrum equivalent to the one Vel�zquez constructed in Las Meninas where the artist's precise physical position in relation to the serving maids, dwarfs, and members of the Spanish royal family is impossible to pin down. The consensus is that a large mirror is part of Vel�zquez's multiple portrait, although no floor plan has ever been postulated to show how it facilitated the artist as he worked on his canvas. The tour de force painting in Garbe's exhibition shows Farris (whose first passion was dance) wearing a pink tutu and seated in an armchair with a blond, curly-haired dog on her lap. Farris's face is sober, and the mottled flesh tones indicate the influence of Lucien Freud. An image at upper left of the canvas shows Garbe working on the painting, reflected in a circular mirror. What creates the sizzle in this portrait is the large swatch of pink tulle that spills over the arms of the chair, under the perfectly painted small dog, and down onto the floor. It's as though Farris's pet is settled into a cushion of pink candy floss. The painting was created in the artist's studio where, obviously, all sorts of magic happens. Garbe set himself a high challenge when he chose to include a trompe d'oeil rendition of the tulle - and in Art Dealer and Dog he vaulted over the bar.